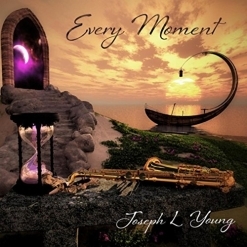 Every Moment is the fifth album from multi-instrumentalist/composer Joseph L. Young, but is a first for me. Man, I really need to catch up here, because this album is AMAZING! Ultra-smooth for quiet, relaxing times, it is also packed with substance for those who want to really listen to their music (like me!). The lead instrument on most tracks is saxophone, but Young also plays keyboards, synths and a variety of flutes as well as supplying vocals in a few places. With influences from many cultures and music genres, this is an album that doesn’t fit neatly into any specific category except “really good!! !” There isn’t a weak track on this whole album (twelve pieces), and that doesn’t happen very often. I’m quite sure this will be one of my Favorite Albums of 2018. Joseph L. Young grew up in Boise, Idaho and has been involved in music all of his life. He started playing saxophone in the sixth grade and began layering music on keyboards and synths a short time later. He released his first album, Pathways, in 2004 and his 2016 album, Ethereum, earned a number of prestigious awards and nominations. My guess would be that Every Moment will do just as well if not better. In addition to teaching and performing in flute gatherings and festivals throughout the US, Young regularly plays with Celtic-fusion, Latin-rock, and R&B groups - talk about versatility! Every Moment opens with “Prism,” a dreamy piece with a gentle rhythm and silky-smooth sax. Young also plays a haunting tin whistle that is just perfect for this piece. (I’d like to see him play both instruments at the same time in concert!) “Falling Through Time” picks up the tempo a bit with a catchy rhythm behind the soulful sax. There are vocals in this piece, too, but they are somewhat in the background and serve as another colorful instrument. I really like this one! The title track is somewhat more ambient and atmospheric, velvety smooth and warm - gorgeous! The hypnotic “Twilight” soothes with a cooling, magical peacefulness that lets the cares of the day gently slip away. “Time Traveler” edges toward a very smooth jazz vibe and includes Cornell Kinderknecht on bansuri flute. “Vicariously Blue” (great title!) has a strong Native American flavor and is a duet for Native flute and sax plus percussion and other layered sounds. The flute and sax are both very earthy but in different ways, and make an enchanting duo - also a favorite. “Chronos Dreams” is warm and velvety and includes Lisa Bittick on viola - another soulful duo. “Letting Go” has a shimmering, ambient musical backdrop behind the lyrics and vocals written and performed by Rona Yellow Robe (the lyrics are translated in the liner notes of the CD). “Eleventh Hour” goes in a more intense direction with a sense of urgency that often sounds like a plea. Drums and percussion add a driving beat to the mix - also a favorite. “Evening Repose” has calming ocean sounds behind the languid sax and light keyboard, bringing this excellent album to a serene close. Every Moment is an exceptional listening experience from the first note to the last, and I give it my highest recommendation! It will be released on March 30, 2018 and will be available from Amazon, iTunes and CD Baby, among other outlets and platforms.